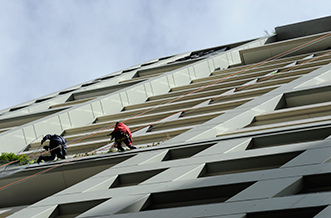 Rope access – or abseiling – window cleaning and maintenance services for Sydney high rise buildings are at the heart of what we do. Originally developed for the offshore gas and oil industries in some of the world’s most challenging work environments, commercial rope access enables our experienced technicians to perform cleaning and maintenance work at heights and other difficult-to-reach areas. Access is usually the greatest challenge to high rise building maintenance since specialist equipment and expertise is required. We typically provide the necessary expertise and equipment necessary for safe access and building maintenance. The benefits of abseiling maintenance are numerous. With minimal set-up time, rope access means significant cost savings. Think of it as paying for the job itself to be done, rather than having to first pay for expensive, disruptive and unsightly scaffolding, lifts or cradles to get the job done. Rope access means your tenants, staff and visitors don’t need to be inconvenienced or face safety concerns while maintenance work is conducted. Abseiling offers a ‘soft touch’ option, with no risk of damaging building surfaces. Our access doesn’t involve machines or complex equipment that can break down or fail – just skilled experts. Abseiling technicians can reach and clean or repair the seemingly unreachable. Despite its inherent dangers, industrial rope access has an enviable safety record founded on Trade Association (IRATA) qualifications. Prorax’s fully-insured technicians are trained to the highest standard and held to strict work guidelines, which is reflected in our unblemished safety record. Whether window cleaning or performing maintenance, rope access puts technicians in close touch with building surfaces, alerting them to issues you may not be able to readily see. As part of its service, Prorax provides free basic façade reports when we come across potential or current problems, as well as detailed risk assessments, method statements, and preventative maintenance schedules. PRORAX has a professional team of highly trained and experienced abseilers with the company you are guaranteed of unmatched service for all your building maintenance or window cleaning needs. Contact us today on 1800 040 117 for a quote and cost effective solution.